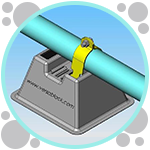 The VERSABLOCK by Freedom Inc. is an innovative pipe and conduit support system designed to minimize costs and make installation easier. 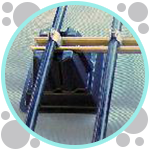 Our rooftop pipe supports disperse weight evenly and have no sharp edges to harm your roof. The E BLOCK is the ultimate conduit support system for electrical contractors. It features specially designed slots and accepts strut clamps without the use of an actual strut! 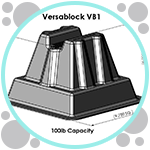 Made with only high-quality materials, the VERSABLOCK is designed to last. Each of our rooftop pipe supports have been tested to support up to 100 pounds with absolutely no loss of integrity. Call us right away to order our innovative pipe blocks today. Installing pipe just got easier thanks to the VERSABLOCK pipe support systems by Freedom Inc. of Caldwell, Idaho. Our patented pipe blocks are inexpensive, versatile, and easy to transport. Imagine never having to haul around extra wood to cut awkward supports for your pipe work. The VERSABLOCK makes it possible. Our inexpensive pipe support systems can be purchased from virtually any supplies that carry top-of-the-line plumbing accessories. Alternatively, you can email, call, or fax your order directly to us. All of our products can be shipped directly to your location for less than $9. Order in bulk quantities to receive a significant discount! Learn More About VERSABLOCK by Freedom Inc.